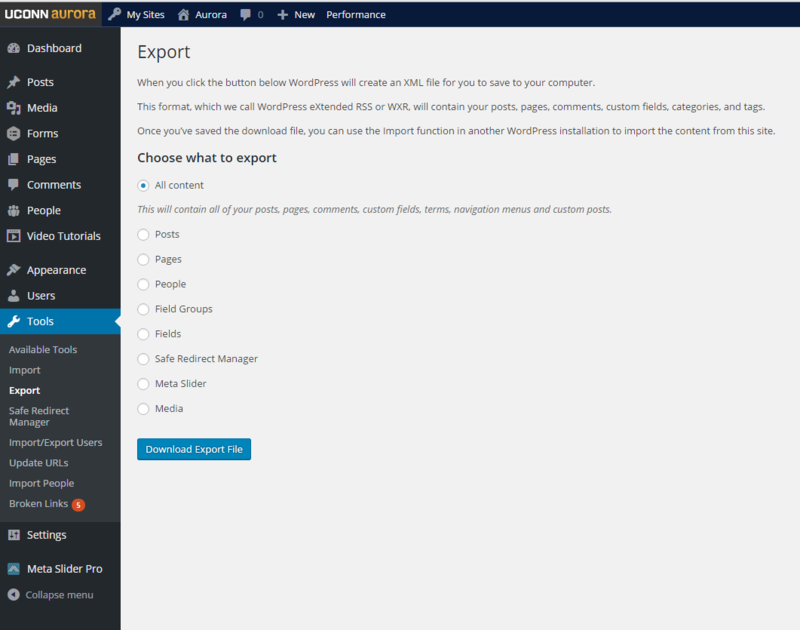 You can export your site at any time by logging in and using the Tools > Export screen. This option is useful for developers that want to try out a custom theme or plugin using their site's actual data, or for websites in Aurora that need to be moved to another server. Note that Gravity Forms uses a separate import/export tool from the rest of WordPress. So, if you need to move forms, be sure to use its tool as well. First, select the form you would like to edit in the dashboard. After setting up the field you want to populate, hover over it and expand more options by clicking the blue arrow that appears. Then to define what value should be used to dynamically populate the field, click the ‘Advanced’ Tab. At this point, you will see an input field called ‘Default Value’. Hovering over the question-mark will show you that you can use merge tags here to pre-populate the value of your field. To access some default merge tags, you can use the dropdown to the right of the ‘Default Value’ input for some merge tags like ‘User Display Name’, ‘User Email’ and ‘User Login’. For the list of merge tags, visit the Merge Tags page in the Gravity Forms documentation. Gravity Forms provides merge tags that allow you to dynamically populate fields in forms using information about a user logged into your website. In order to use information about a user completing your form, the page your form is on should be private. This feature can be useful if, for example, you want to setup a newsletter subscription form. Using merge tags, you can auto-fill the name and email-address of a user so they do not have to. Once logged into your site, click on Forms. There will be a some instructions on how to get started.